One of my Xmas gifts is Wacom's Bamboo, a digital pen mouse. I can draw and write with this stylus doohickey and life will be easier. Well, as soon as I get the hang of it anyway. My usual modus operandi is using my finger on my MacBook's touch pad to play in Adobe Illustrator. Actually, I haven't used a mouse in the 3 or so years I've had the Mac, so it's felt the molestation of my fingertips quite a lot. I wonder if said touch pad will feel cheated now that there's a shiny new gadget USBed in alongside, with it's smooth and schnazzy appearance? No worries touch pad, you're always numero uno. Enjoy my first foray into Bamboo art. 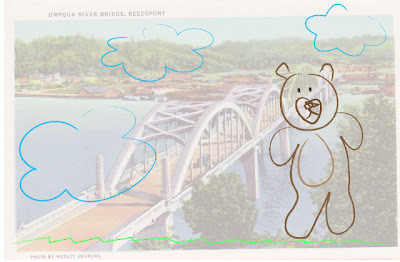 I call it "Bear Travels to Umpqua River Bridge, Reedsport." It can only get better from here. 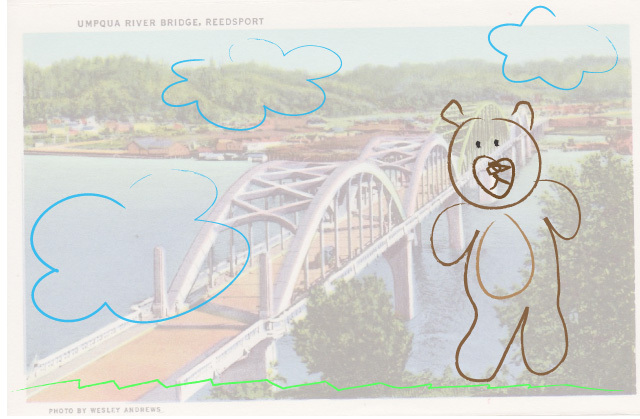 Speaking of rough bear art, I'm shocked that I haven't posted anything from my "Hello Bear," series! Well, I'll fix that soon.